As is my habit with all major holidays, when Thanksgiving approached, I took a "pause" from our normal history curriculum to weave together a holiday unit-study. But this year, as I gathered my resources and made my final preparations, my tone was more meditative...more reflective. While handprint turkey paintings and construction paper pilgrim hats are fine, I purposed to de-clutter our holiday. With my children seeing advertisements of the big box stores opening their doors earlier than ever on Black Friday creating a Black Thursday, I wanted to refocus our family on what truly matters about this national holiday. I wanted to put THANKS back into Thanksgiving and spend two weeks directing our attention to The One worthy of it. And so, I scrapped the cute acorn cookies. I scrapped the paper bag Native American vests. I scrapped the homemade cornucopias. In truth, none of these ideas were all that bad. They just weren't the best for my family for THIS Thanksgiving. In my effort to provide meditative reflection for both the history and the true purpose behind our national day of thanks, my selections were simple. Simple activities and simple resources. For the past two weeks, we have spent our dinner-time family devotions focused on nothing but worship and praise. Each night, we have gone around the table giving words of Thanks for specific attributes of and blessings from God. 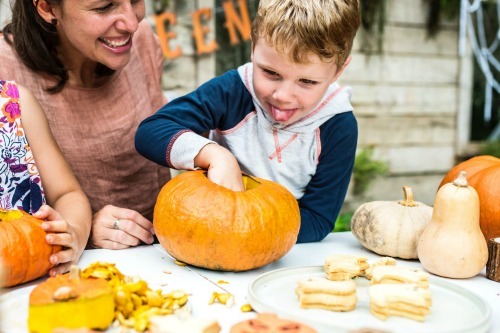 While it is nice for children to respond to a "What are you thankful for?" prompting with a curt, "My mom and dad" or "My toys", The Hubs and I wanted our kids to begin to grow a specific and purposeful list of gratitude. Our evenings have been filled with thoughtful and thankful discussions of undeserved grace and goodness. We've made a tree of thanks in some form or another for many years. This year ours was gifted to us by a group of treasured motherly mentors. Each paper leaf bears Truth...a passage of Scripture intentionally chosen to provoke a heart of thanks. I plan to bring this thanks GIVING tree to our annual family feast and with the children's help will encourage each extended family member to pick a leaf, meditate on the gift of Truth it gives, and write a note of gratitude on the back. We will spend time sharing our thoughts of thanks before the meal is served. Here's a list of my favorite Thanksgiving-themed books in rough chronological order. Most of these are classics. A few are out of print. Here is a short list of my recommendations for Thanksgiving-themed chapter books for kids to enjoy on their own. For the sake of my littlest ones, we enjoyed a family movie night featuring A Charlie Brown Thanksgiving which is surprisingly historically accurate. In a world filled with discontented people clamoring to get a better deal on the next big thing, I wanted to take two weeks and be intentional to GIVE. THANKS. I wanted to simplify in order to clarify. I wanted to be plain on purpose. 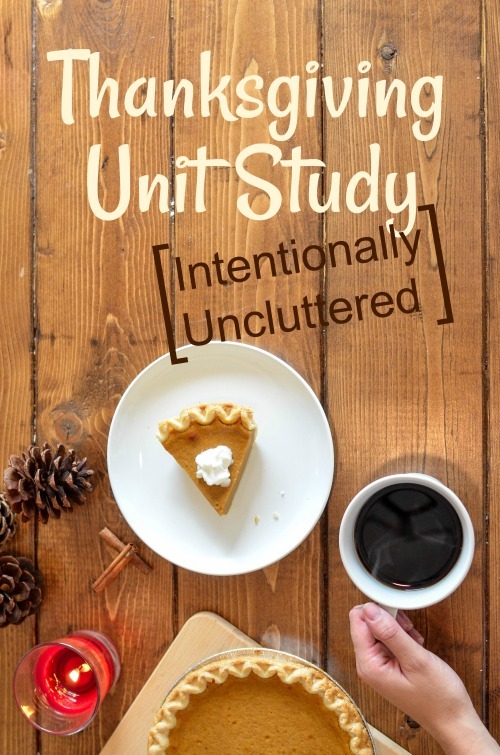 A Thanksgiving unit study intentionally un-cluttered. I have to thank you for all the info you share on your blog! I have much to learn from you!! Thank you for sharing these ideas. It's not too late-I'm going to incorporate some of these into our Thanksgiving week. This is great! Going to use this for Thanksgiving this year! Thank you. Love this! Thank you for sharing this simple yet effective unit study! I was looking for new unit studies for my children. Thank you for posting this unit study. Do you mind if I bookmark this and then print it out to use with my children when the time comes? This is just what I needed. I love your blog. Absolutely! Please bookmark and use when the time comes.